Definition: The photoelectric transducer converts the light energy into electrical energy. It is made of semiconductor material. The photoelectric transducer uses a photosensitive element, which ejects the electrons when the beam of light absorbs through it. The discharges of electrons vary the property of the photosensitive element. Hence the current induces in the devices. The magnitude of the current is equal to the total light absorbed by the photosensitive element. The figure below shows the scheme of semiconductor material. 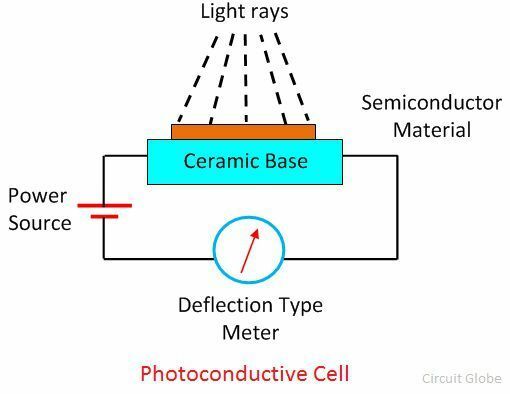 The photoelectric transducer absorbs the radiation of light which falls on their semiconductor material. The absorption of light energises the electrons of the material, and hence the electrons start moving. The mobility of electrons produces one of the three effects. The resistance of the material changes. The output current of the semiconductor changes. The output voltage of the semiconductor changes. The photoelectric transducers are classified into following ways. 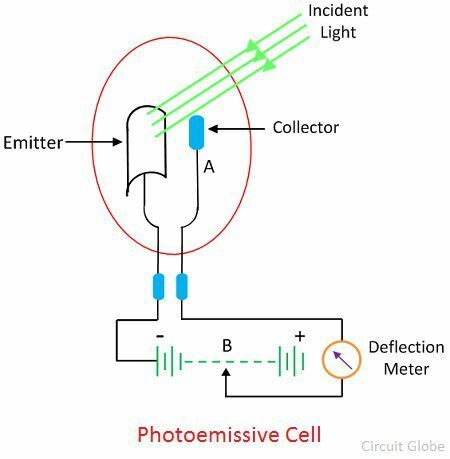 The Photoemissive cell converts the photons into electric energy. It consists the anode rode and the cathode plate. The anode and cathode are coated with a Photoemissive material called caesium antimony. When the radiation of light fall on cathode plates the electrons starts flowing from anode to cathode. Both the anode and the cathode are sealed in a closed, opaque evacuated tube. When the radiation of light fall on the sealed tube, the electrons starts emitting from the cathode and moves towards the anode. The anode is kept to the positive potential. Thus, the photoelectric current starts flowing through the anode. The magnitude of the current is directly proportional to the intensity of light passes through it. The photoconductive cell converts the light energy into an electric current. It uses the semiconductor material like cadmium selenide, Ge, Se, as a photo sensing element. When the beam of light falls on the semiconductor material, their conductivity increases and the material works like a closed switch. The current starts flowing into the material and deflects the pointer of the meter. The photovoltaic cell is the type of active transducer. The current starts flowing into the photovoltaic cell when the load is connected to it. The silicon and selenium are used as a semiconductor material. When the semiconductor material absorbs heat, the free electrons of the material starts moving. This phenomenon is known as the photovoltaic effect. The movements of electrons develop the current in the cell, and the current is known as the photoelectric current. 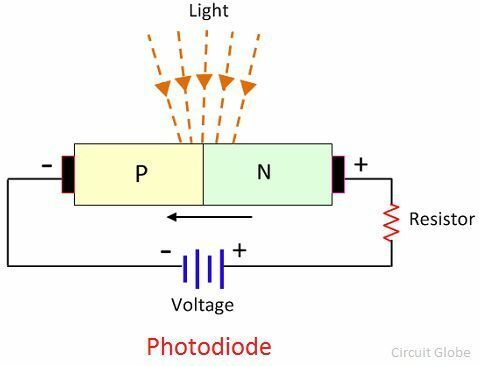 The photodiode is a semiconductor material which converts the light into the current. The electrons of the semiconductor material start moving when the photodiode absorbs the light energy. The response time of the photodiode is very less. It is designed for working in reverse bias. 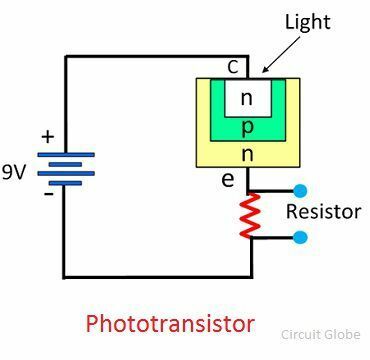 The phototransistor is a device that converts the light energy into electric energy. It produces both the current and voltage. 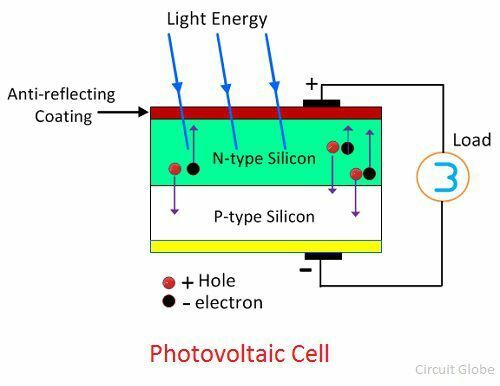 The photovoltaic cell is a bipolar device which is made of semiconductor material. The semiconductor material is enclosed in an opaque container in which the light easily reaches to the photosensitive element. The element absorbs light, and the current starts flowing from base to emitter of the device. This current is converted into the voltages.